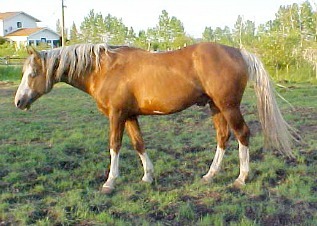 Tru High Style APHA # 617,033 and PHA # 13120-2001 Palomino Overo Stallion Sire: Truly A Chief by Positively Grand by Tarzan Terrific x Leo Ramona Top and Black Gypsy Lady by Also Sixx Pax To Go x Reed Flight.Dam: Stan's High Yellow(AQHA) by Grandstan by Wiley Williams x Celeste Levis.As well as being APHA registered Spike is also registered with the Palomino Horse Association,which is the original palomino association that has been around since 1936 and has famous palomino horses such as Mr.Ed,Trigger and trigger Jr. just to name a few.Spike isn't specifically bred for one discipline per say,his foals are excelling at many different ones such as team penning,gymkhana,eventing,jumping,4-H,showing,lesson horses,breeding and even driving.We have a couple of them pictured on our home page,but most of them our on our HF photo album/ Foals page.Spike is a wonderful stallion who is very easy to deal with on the ground and at breeding season.I know other people who have Truly A chief offspring and they say the same thing about them.It makes no difference gender wise they have they have great minds and disposistions and willingness to learn.This handsome blue eyed guy has produced almost every horse color there is starting from the obvious palomino,buckskin,bay,smokey black,black,sorrel and a couple of debated on dun looking foals.We are happy with what he is producing and enjoy feeback and updates including pictures.Most of Spikes foals are APHA registered,there are a few that pinto registered and a couple that are not registered at all.To check out more horses in Spike's pedigree check out our reference horse page. *Please note we do not stand Spike to the public for breeding. Spike looking like a newly minted loonie!! I have had several palominos and really like the dark color versus the light color. 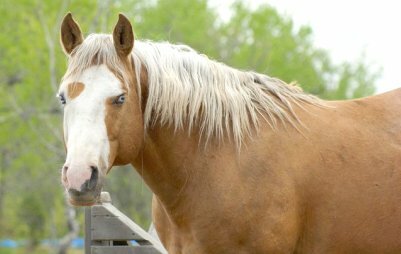 A head shot of Spike's pretty head and baby blue eyes.Most of his foals get his head and great dispostion,as for the blue eyes that's a roll of the dice. Here is a really nice ad my friend did for us advertising our farm and Spike.Designs by Karen Bittner she does awesome work!!! 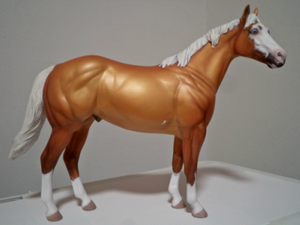 I always wanted to have a model done of Spike to commemorate what a wonderful stallion he is.I finally did it so I'd have it when I'm an old lady remembering her wonderful horses when I am long out of the breeding business.Katie Q Customs is the business I used and would highly recommend them. 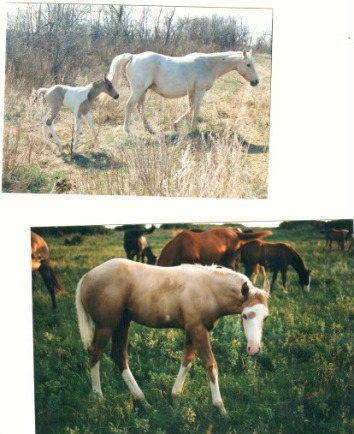 Pictured at the top is Stans High Yellow dam of Tru High Style she is 19 years old in the picture and has a buckskin tobiano colt at side who was sired by Texan Bar Time who is pictured on our reference horse section-this mare had 10 foals by Texan Bar Time and was 22 years old when Spike was foaled.She was Skipper W, Leo & Three Bars bred as well as other greats in her pedigree.Pictured below is Tru High Style as a foal out in the pasture.He was a cutey!!!! Thank-You very much to Nadine Hames for the pictures. 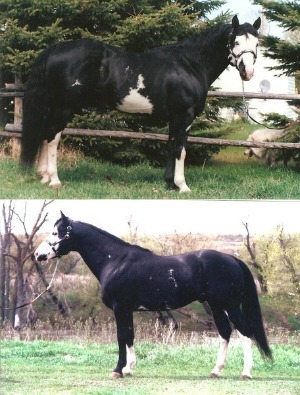 Truly A Chief APHA# 194,319 1991 Black Overo Stallion by Positively Grand x Black Gypsy Lady who was bred by Penny Fredericks of Halliday,North Dakota.This stallion is 15.2hh 1400 lbs and has sired several high selling foals at the Rocking W Sale,Border Breeders,Loud & Proud and Swift Current Sales as well as sales off of the farm he stands at.He has good old working bloodlines as well as some foundation bloodlines as well.This guy sires ranch horses,pleasure horses,trail horses and numerous breeding stock and show stock that have size and color & disposition.I can't say enough about him & can attest that Spike has a wonderful dispostion as do his foals. 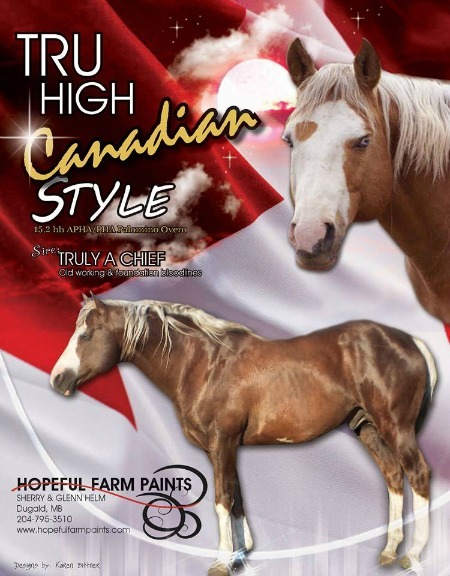 *PLEASE NOTE HOPEFUL FARM DOES NOT OWN TRULY A CHIEF-HE IS THE SIRE OF OUR STALLION TRU HIGH STALLION AND IS OWNED BY NADINE HAMES OF HAMES PAINTS & QUARTER HORSES IN OXBOW,SASKATCHEWAN. 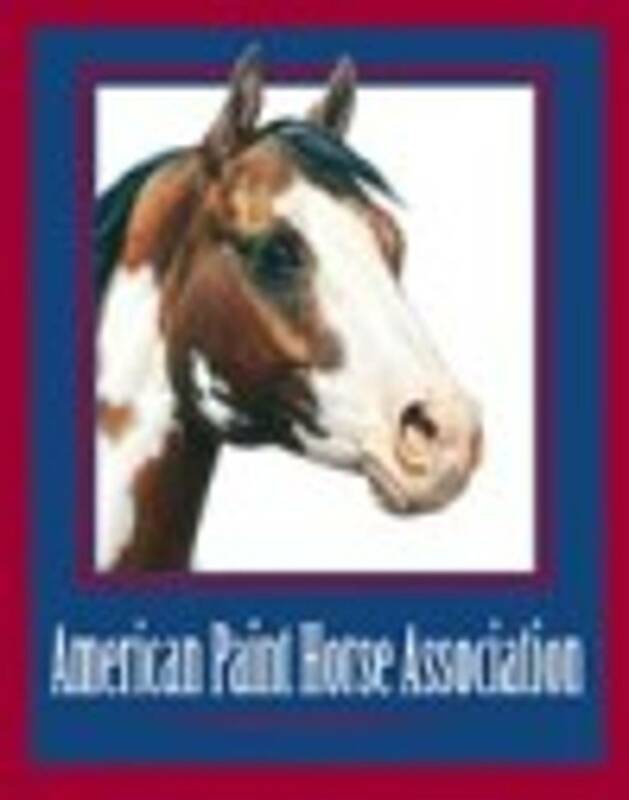 HF Tru Imprinted Kid APHA# 103,8532-2014 Palomino Tobiano Stallion sired by Tru High Style who is by Truly A Chief x Stans High Yellow.Dam: CL Imprinted Angel who is sired by RH Mr Imprint who is sired by Socketts Imprint x Miss Sundays Kid Clu who is sired by Kid Clu.I have always wanted to keep a colt off of Tru High Style back to see how he'd turn out.I have been waiting for the right one & finally have him!! 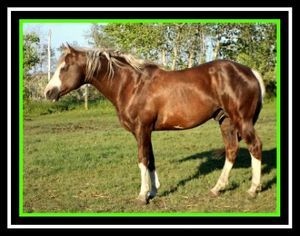 Tru Imprinted Kid who is otherwise known as Banner is the best stallion quality colt we've gotten thus far in my opionion.We have had many great colt's over the years,but this guy was special-i knew that the first time I saw him.He has fantastic breeding & is through & through halter bred on his dam's side,she is an own daughter of RH Mr.Imprint & both a granddaughter of Sockett's Imprint & Kid Clu.Her great-grandsire's are Sockett & Obvious Conclusion,there are many more great horses in her pedigree that can be seen on our reference horse section as there are to many to list.Tru High Style is performance/working horse bred his pedigree has old style bloodlines,his sire Truly A Chief is pictured below Tru High Style's right up-his accomplishments are mentioned as well as his offspring's.Truly A Chief's sire Positively Grand had many great horses in his pedigree such as Blondy's Dude,Sugar Bars & Wimpy just to name a few-his back ground was predominately working cow horse.Truly A Chief's dam Black Gypsy Lady had lot's Skipper W breeding,she had Skipper W,Skip Shi & Skipper's King & Nick W who sired by Nick Shoemaker who was also the sire of Skipper W,she had some running quarter horses in her pedigree such as Top Deck.Tru High Style's dam Stans High Yellow was pretty much a broodmare her whole life,but was shown for a couple of years.she is pictured as well by Tru High Style's info.Her sire Grandstand was a ranch horse through out his life other than being used as a stallion,his pedigree has the likes of Gold Mount,Old Sorrel & Top Deck.Stans High Yellow's dam Style Bar was also heavily Skipper W bred,she had Skipper Dell,Skipper's Style,Skip n Scoot as well as Slipalong Weiscamp.She was shown in gymkhana events until she was injured & was then a broodmare the rest of her life.With some of the breeding I have listed I would say Banner has a pretty great pedigree.He has a good mind & conformation,his good looks & color are a bonus.He will not be used for breeding until 2016. Banner enjoying a good brushing from my husband Glenn who has worked with him since he was a young foal. Banner getting fed some hay by my youngest niece Maggie who is 2. Banner interested in my oldest niece Georgie who is 4. Tru High Style and HF Tru Imprinted Kid having a father & son bonding moment.The two of them get along very well and play with each other,which they were doing in this picture.